I don’t know quite how it happened, but somewhere along the way, horses have become a major part of my life. My car (much to my husband’s dismay) smells like hay and horse more often than not thanks to riding lessons for the youngest one and my weekly volunteer sessions at the local therapeutic riding center. I love the creatures and though I do not ride, I understand the deep connection between a rider and a horse. And I do seem to be drawn to all things equestrian which may explain my fascination with what is to take place tomorrow (as it has for hundreds of years) in the city of Siena. 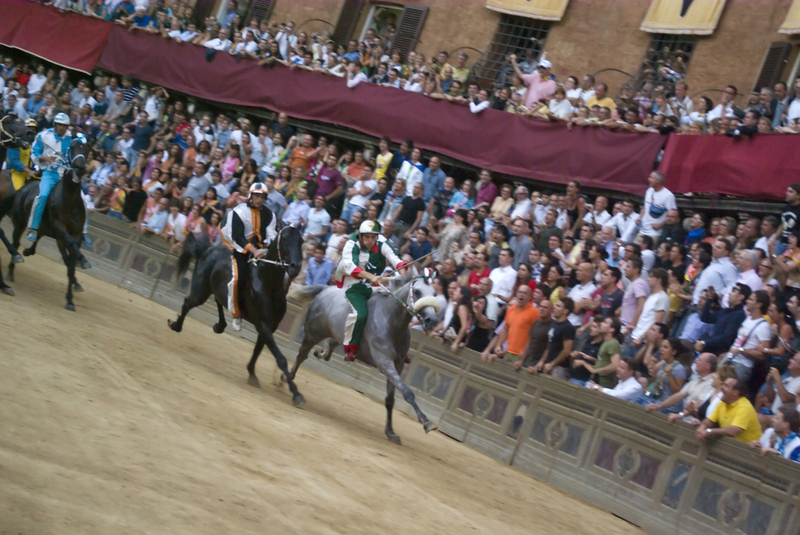 July 2nd is the annual running of the Palio in Siena, horse race that has taken place in some form since the Middle Ages. To understand the implications and importance of this race to the citizens of Siena, one must try to understand the Italians. Italians are much more loyal to their town or city than they are to their nation. The larger cities are divided into quarters or neighborhoods each with its own church and bell tower for its residents. In Siena, the city is divided into 17 contrade or neighborhoods and to this day the loyalty to that neighborhood is astounding. The members of the contrada feel the allegiance to that neighborhood above anything else. Every year since the 1300s , this horse race which pits the neighborhoods against each other (with few exceptions) has been held. In Siena for the weeks leading up to the Palio, couples return to the contrada where they were born and baptized. In past generations no one would even marry outside of the contrada but now in this modern age of “mixed marriages” this means that husband and wife spend a few weeks away from each other even though they are in the same city. Throughout the year, planning takes place in the form bribes, pacts between neighborhoods, speculation about alliances and deals being made. In recent years it has become very trendy for travel agencies to offer tours that include tickets to the Palio. While I would give my eye teeth to experience the race first hand, I feel it my duty to let you know that the Palio is not for you. It is not a line item to be added to a bucket list or a unique experience to be included on a luxury tour. It is, and always will be, about the people of Siena and for the people of Siena. The Sienese do not care that others experience this. They actually prefer them not to. This is a fight to be settled amongst the people of this fair city and honestly, I hope it stays that way. For the only people who can truly understand the complete and utter absurdity of caring so much about winning one event are the Sienese. Or Red Sox fans in 2004. There is a fascinating book that has been written about the Palio and the sociological implications of the race. The book is called La Terra in Piazza and it has been translated into English even though the title remains the original. It delves into all the intricacies of this fascinating race and its importance for the Sienese. I highly recommend you read this book.